I've fallen in love. Don't worry, Michael knows all about it. 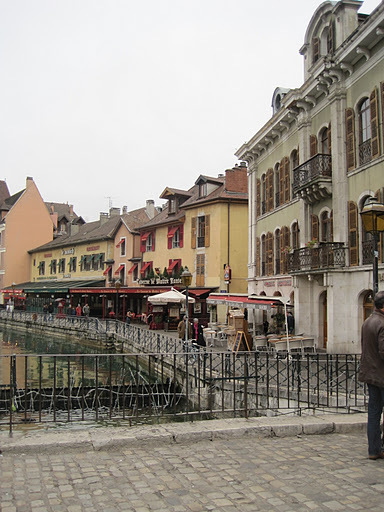 In fact, we've both fallen in love - with Annecy. Seriously, I am obsessed with this town. I don't think I've stopped talking about it since we got back two weeks ago: the mountains, the canals, the quiet side streets, the lake. Even in the cold, slightly gray of winter, this town charmed me completely. don't you want to live here in this house? i do. It's beautiful, enchanting, and only a 5-hour drive from Montpellier. We're already talking about our next trip (hopefully in the Spring when we can fully experience what the outdoors has to offer) and I'm so anxious to return to this perfect weekend getaway. 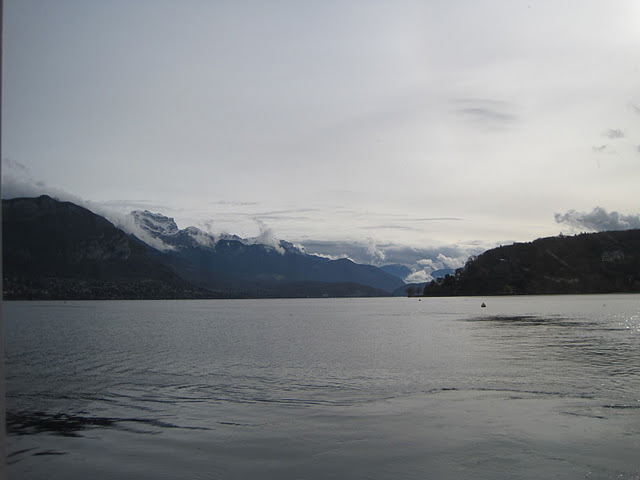 DO: - Do take a Boat Tour on Lake Annecy. Do I really even need to say this? I should just change the names of these posts to "Dos, Don'ts, Eats, and Boat Tours." I was a little worried that the tours might not be running in December, but La Compagnie des Bateaux still has tours going daily (and twice on the weekends) throughout the month. What made this particular tour so special was...Figaro joined us! 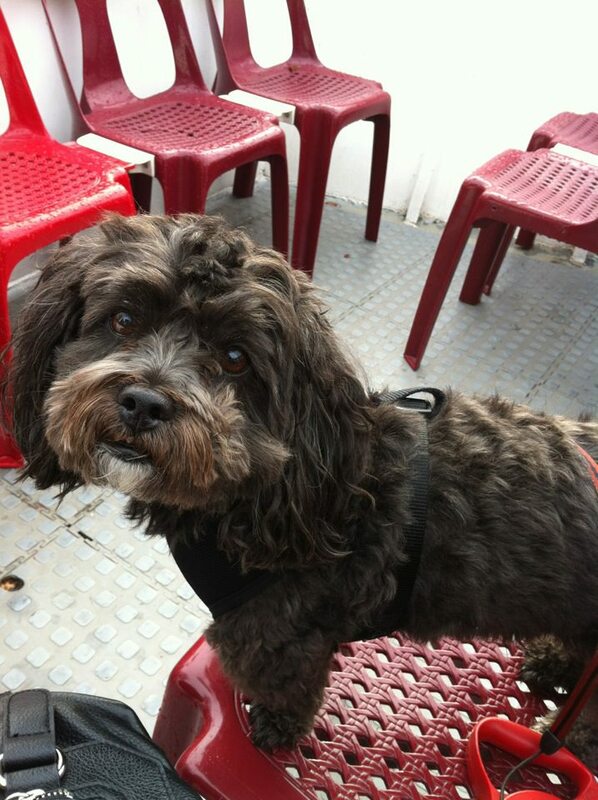 ready for his first boat tour! 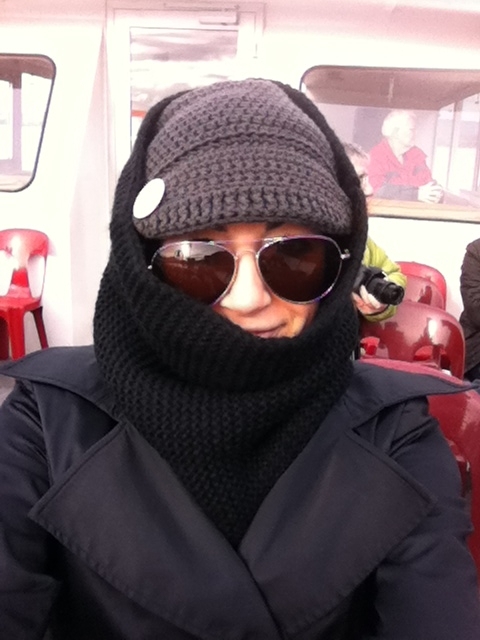 The tour was about an hour long and Fig definitely started to get cold towards the end, so we tucked him into our coats for a bit and then eventually went inside to the sheltered portion of the boat. 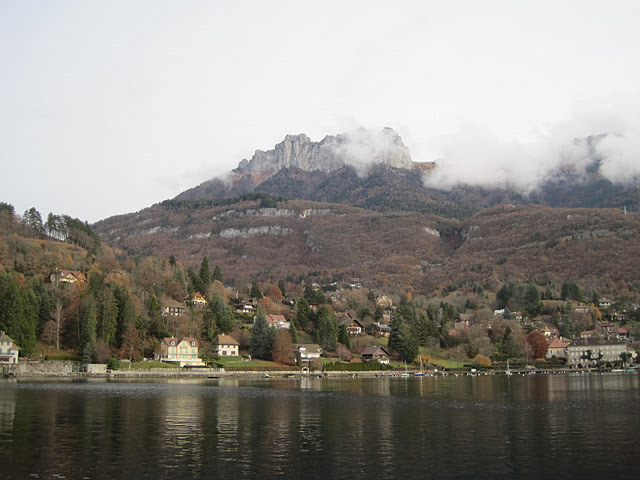 Lake Annecy is incredibly gorgeous and we had a great time taking in the scenery. I kept imagining the leaves a few weeks earlier in the sunny, fall weather. I bet they were glorious! you can't tell from the pictures, but the lake is crystal clear and blue. - Do stay at the Splendid Hotel. First of all, it kind of sounds like The Happiness Hotel, and who doesn't like thinking about The Muppets Take Manhattan? The Splendid is in a perfect location - right outside the old town and across the street from the lake. It seems like it might be pricey in the high season, but we got a great deal on their Residential room for 98€ per night. The room was very comfortable and they allow dogs, which is always a good thing for us. - Do spend some time outdoors. This town is gorgeous. Really. It's so beautiful and there are tons of outdoor activities like hiking, biking, and canyoning which, unfortunately, we didn't get to experience. It was quite wet and rainy during our stay so we mostly stayed in the Old Town, walked around, drank Vin Chaud, and shopped at the Marché de Noël. Of course there is always nearby skiing in the winter, Annecy is in the Alps, after all, but that wasn't part of our weekend agenda. I'm really looking forward to going back in the spring and spending more time outside in nature. - Do try the local libations. I know you think that we only drank Vin Chaud in Annecy. And while we definitely drank more of it than the normal person, we managed to find time to try other things. 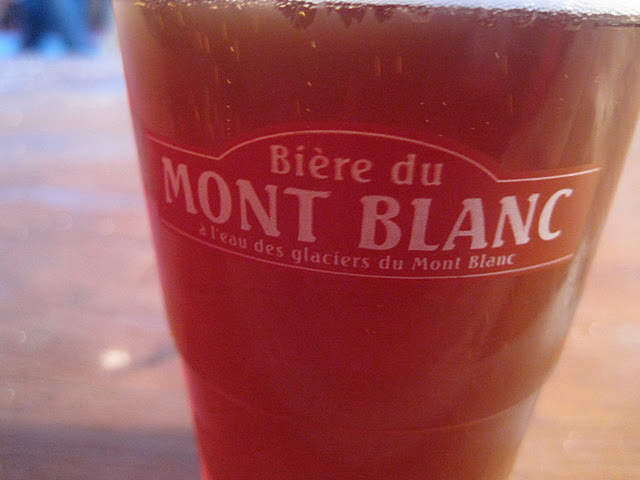 Like bière from the Brassiere du Mont Blanc. 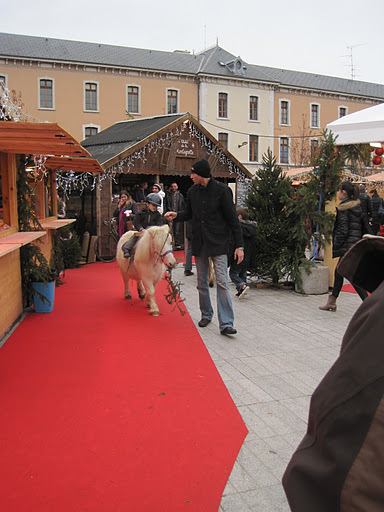 The Rousse was on tap at the Christmas market and we loved it! So much better than the standard light draft beers that usually fill French cafés. We also tried the local, Savoie, wine. Although mostly known for their whites, we enjoyed a few reds. 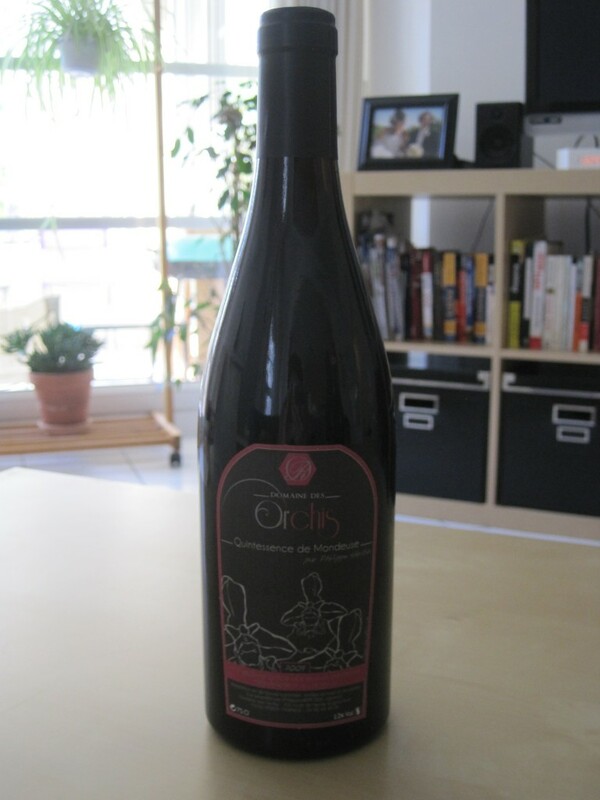 The red grape from the Savoie region is a cousin of Shiraz and is spicy but not as full bodied. 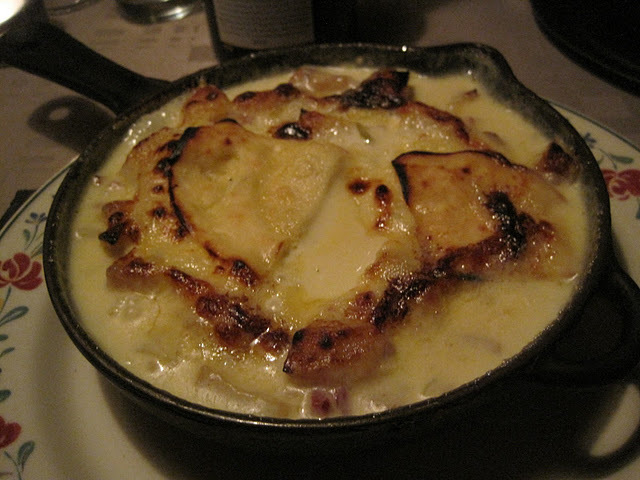 It pairs perfectly with the heavy, local Haute-Savoie cuisine of tartiflette and fondue. We visited a wine shop, Vintage by Juno, and purchased a lovely bottle of local red wine that the sommelier recommended to us. 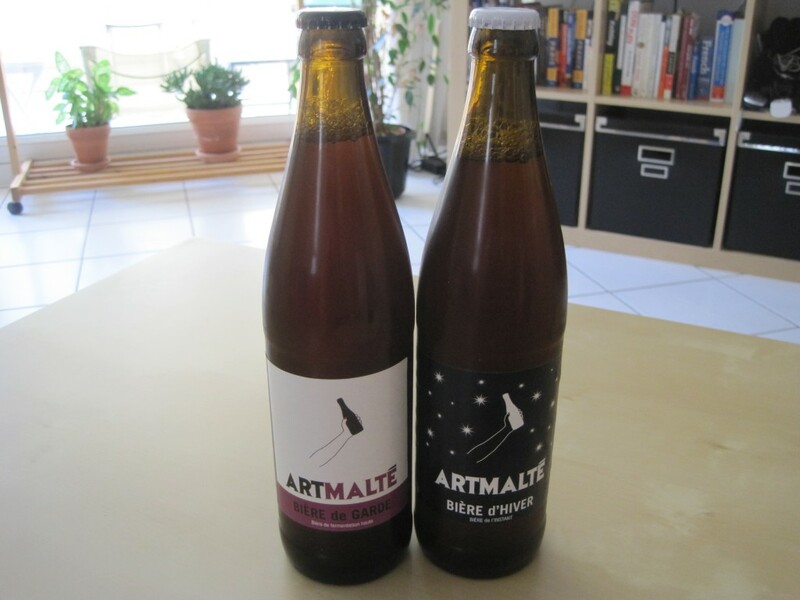 Here we also picked up a few artisanal beers from ArtMalté, a local (woman run!) brewery. We've got the Bière du Garde and the Bière d'Hiver chilling in the fridge, so I'll let you know how they are when we try them. Very exciting since we rarely see locally brewed beers served in France. who said there weren't local brewers in France? 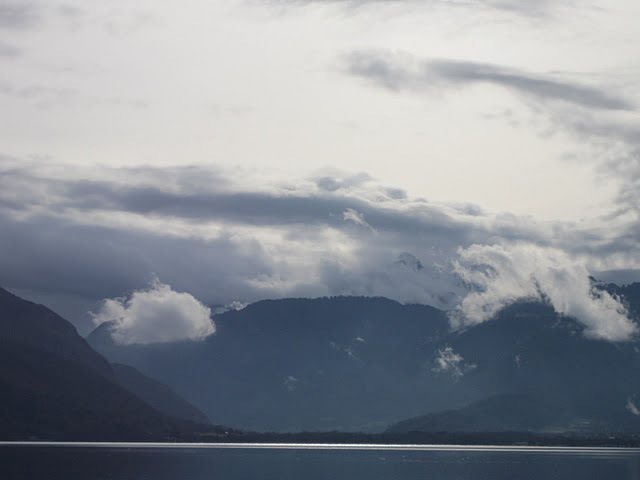 - Do drive through Grenoble and Chambéry on your road trip. 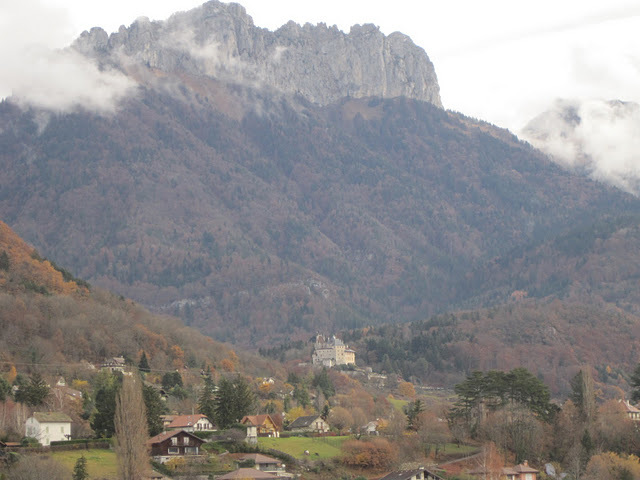 On our way to Annecy, we took a slightly more direct route, but we decided to drive home through these mountain towns on the way home. The extra mileage was worth it, because the landscape was so dramatic and breathtaking. It reminded me of driving through California in the fog when every turn brought a new surprise. DON'T: - Don't forget your dog. 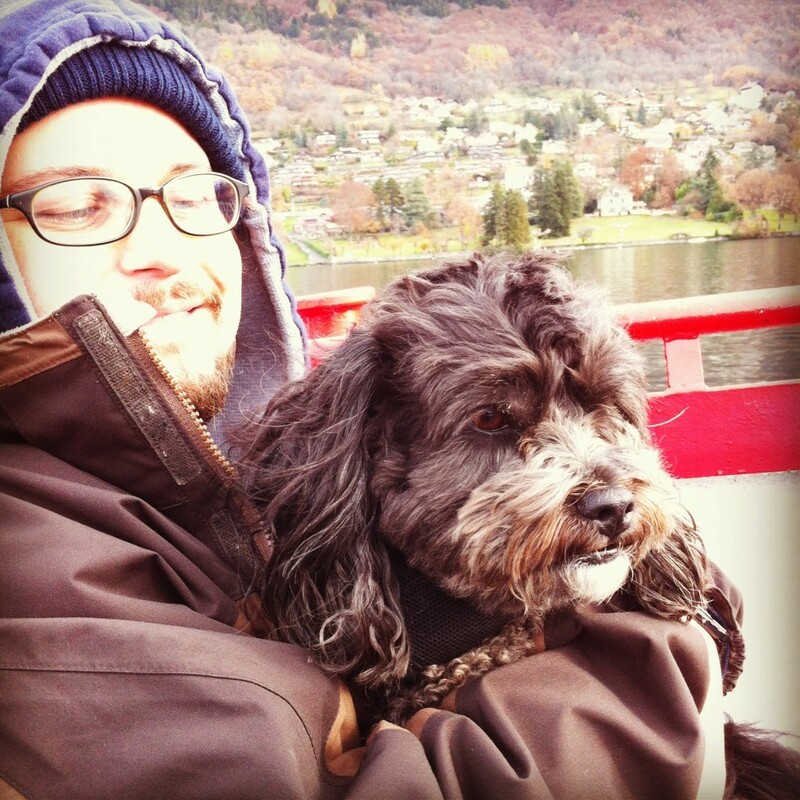 Annecy was incredibly dog friendly and Figgy had a blast. Boat tours! Christmas markets! Walks along the lake! What could be a better for a dog? They even let him into a lot of the restaurants. I think he'll also enjoy hiking on our next trip. 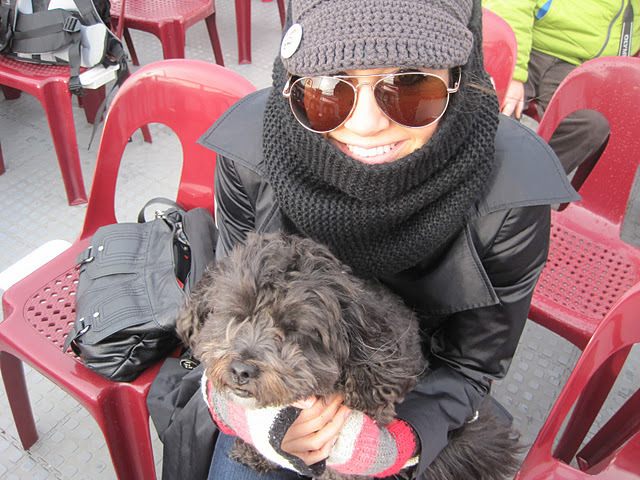 it seems that Figgy fell asleep on the boat tour. don't worry, it wasn't that cold. i just like to be cozy. 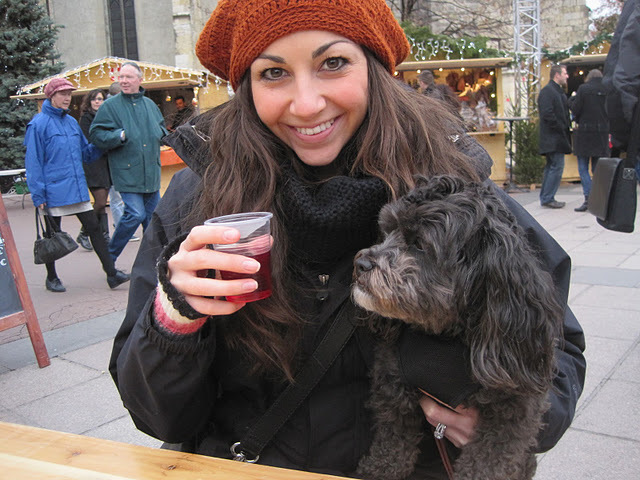 hands off my Vin Chaud, Fig. - Don't be afraid to go in the off season. I really only need to say two words about this: Vin Chaud. Oh, and Marché de Noël. You don't get those in the summertime! Also, you'll get some great deals on the hotels like I mentioned before. Even if the weather wasn't nice enough to fully explore the lake, we still had a wonderful visit. And you can still take a Boat Tour. Which is the most important part, obviously. 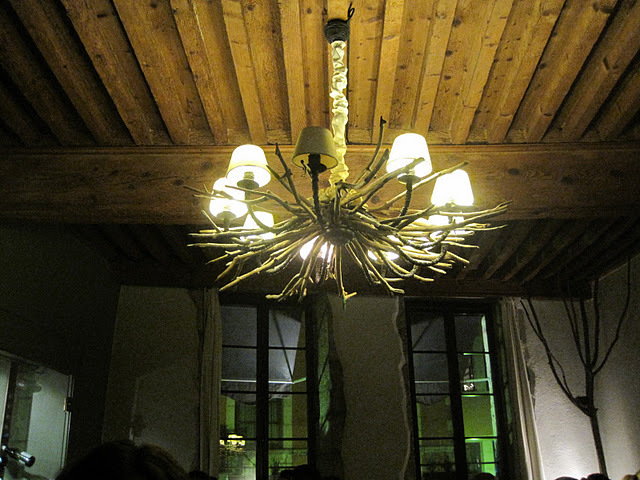 loved the interior, especially this chandelier, even if there is a light burned out. 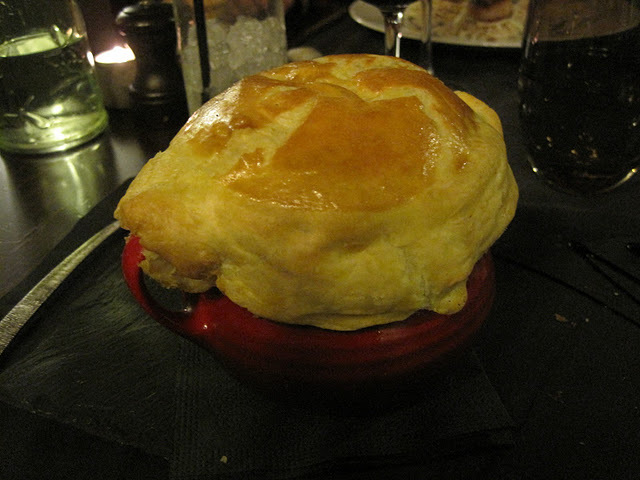 I had an mind-blowing Mushroom Soup/Pot Pie like concoction that made Michael gag and and made me swoon. 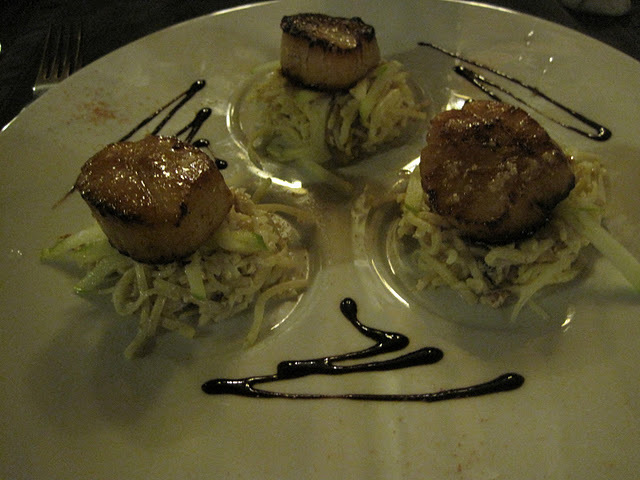 Michael had a Scallops appetizer with Celery Root and Granny Smith Apple Slaw. 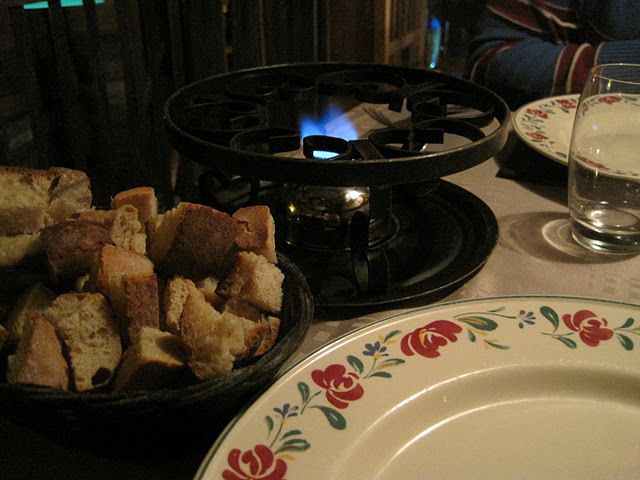 For dinner, I had a scrumptious Tajine de Lotte au Safran and Michael had the Filet de Boeuf. Even though we were getting quite full, we couldn't resist a dessert of Nems au Chocolat and Mousse Légère au Marron. Yum, yum! Alpiz - We walked around for ages looking for a good place for lunch and finally settled on this cute little café just outside of the old town. The owner was so kind and friendly and we enjoyed our House Quiche and Chicken Salad. I think we picked the best restaurant of the lunch bunch. 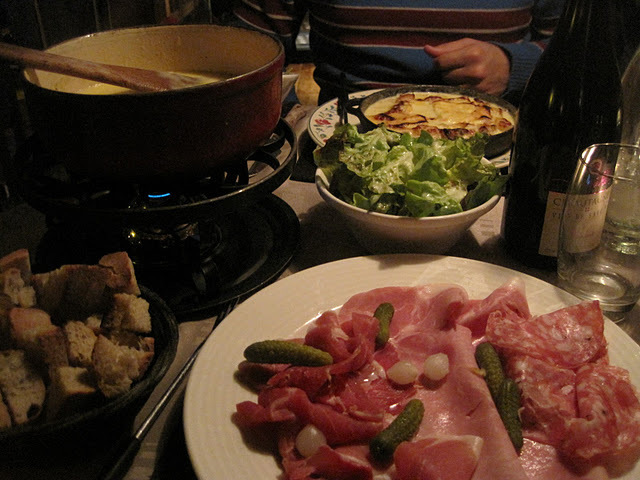 Le Chalet - I had my heart set on going to Le Freti for our traditional Haute-Savoie dinner of tartiflette and fondue. 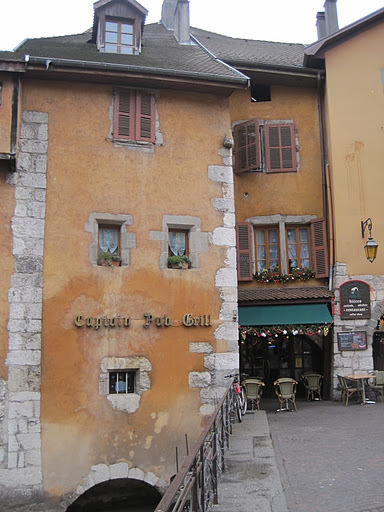 I had heard it was the best place in Annecy for such things and couldn't wait to try it. I called and called and called to make a reservation but no one ever answered the phone. We tried our luck just showing up and were quickly told "Non, non, non!" We needed a reservation...but no one answered the phone...the classic French 22. Disheartened and, admittedly, a little whiny, we headed over to our second choice, Le Chalet. 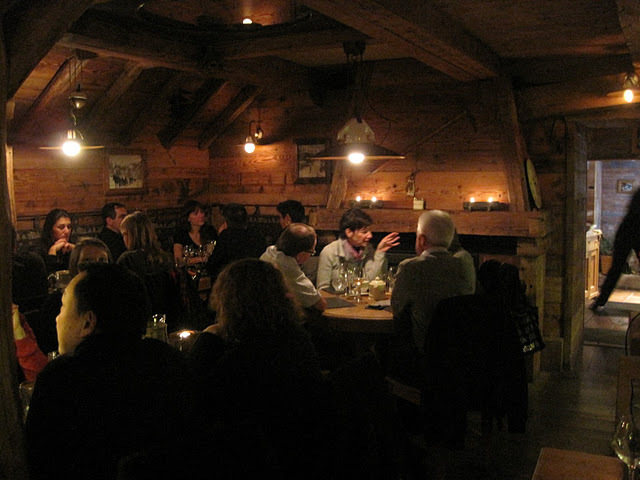 I loved the inside of the Le Chalet. 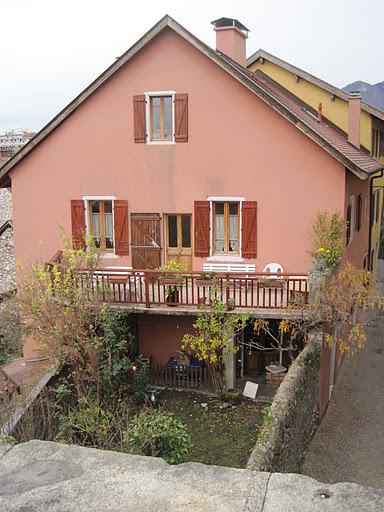 It was like, well, it was a chalet! So cozy and romantic, it was the perfect setting for hot cheese warmed by a fire and sipping wine with my love. They set up a table for us within 10 minutes and the food was fantastic. 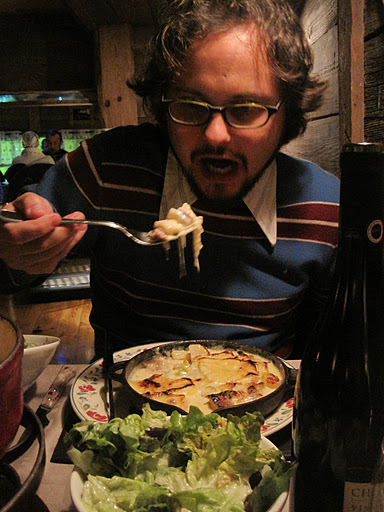 Even though the fondue is sized for two, we still ordered a tartiflette as well, which left our server in absolute shock. Guess he didn't realize we're Americans and we like to pig out. We had to try both! our decadent spread - no room for dessert tonight!! Next time, Le Chalet will be my first choice. Captain Pub - Every good mountain town needs good Pub, which is exactly what we found at Captain's Pub. There are funny signs and cool posters on the walls and a long list of international beers behind the bar. 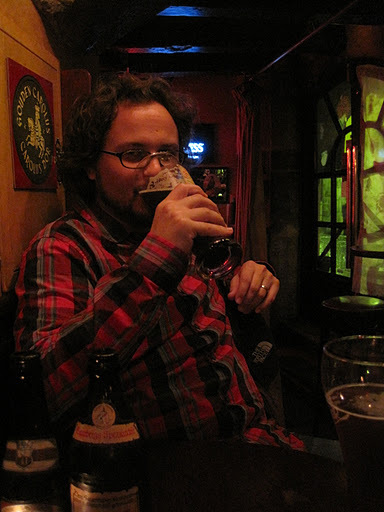 They also serve small tapas, but Hub and I came here after dinner on both nights for some good beers. 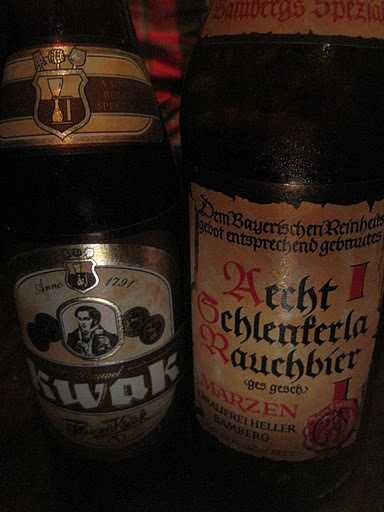 I enjoyed my usual Kwak while Michael had a few of these smoky beers which kind of tasted like bacon in a bottle. And that's a good thing. kwak on the left, smoky beer on the right. perfect on a cold winter's night! As it turned out, speaking English made us the most popular couple in the bar. So many people came up to us to talk and practice their English and we made lots of new friends at this neighborhood hangout. 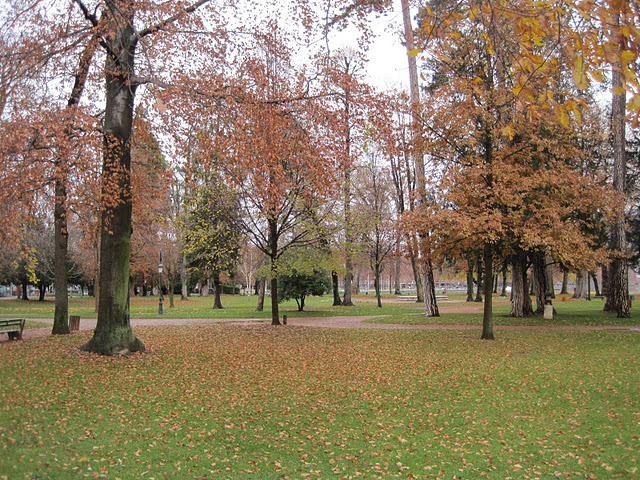 I can hardly wait to return to my new favorite town in France! 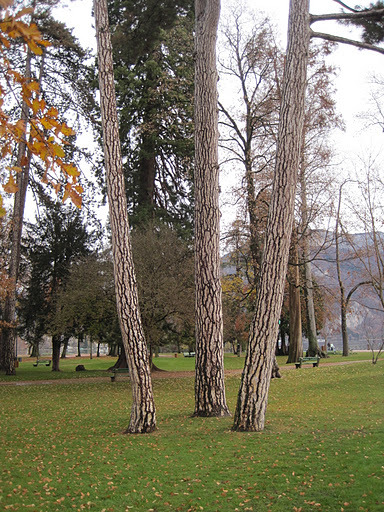 À bientôt, Annecy! gorgeous natty!! amazing food as always — gimme that mushroom soup! the canal photos remind me of amsterdam. Reminds me of the boat tours in Switzerland! It looks a lot like Lake Lucerne! Looks amazing! I’ve never been but now I want to go. They did a stage of the tour de france there over the summer and the views were ridiculous. 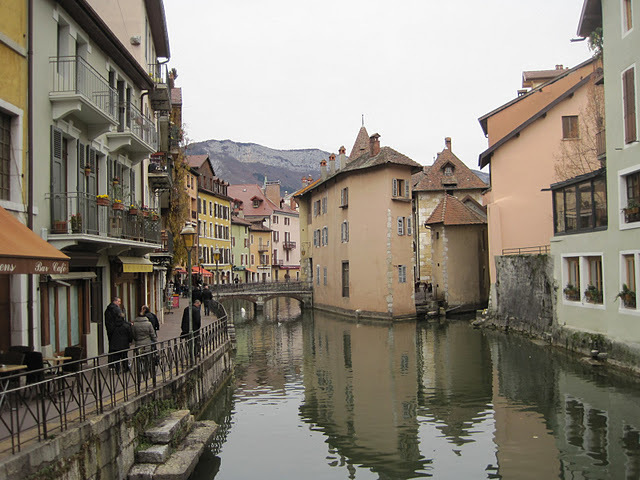 Thank you for a great review of Annecy. Going this summer and enjoyed reading your blog. Thank you for the info we are on our way there in March. Thank you for the information. I am definitely going to try the restaurants you eat at. My husband is going for a Conference in April, and I am tagging along. Did you feel safe enough to walk around by yourself during the day? We are staying about a 5 minute walk from the old town area. Hi Tami! Yes, I definitely felt very safe. 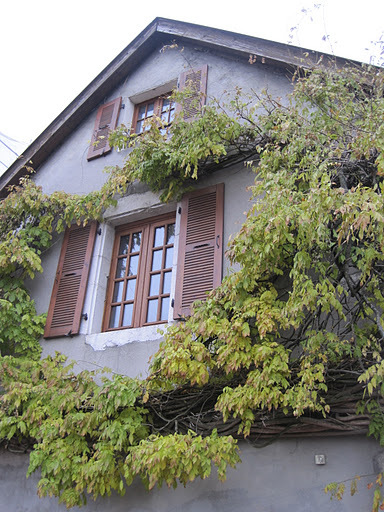 Annecy has a lovely village feel. I hope you have a great time! Did they feel safe? We’re coming from South Africa! ROFL..!! Julie, Annecy is SAFE. I live in South Africa, and constantly have my head on a swivel. Ugh. There are no worries like we have in SA. If you can let your guard down, you will love it! Have a wonderful time! I miss that place, it is so beautiful! this is a great and helpful review. 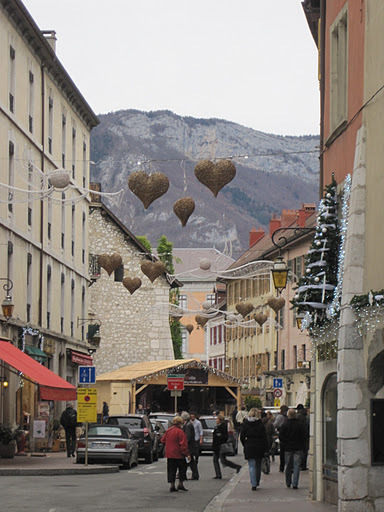 I am going to Annecy for three days in December over Christmas with my hubs. So this has a lot of info I needed. Thanks for sharing your insights. We find these types of blogs give us great insight into planning our trips and make them so much more enjoyable. 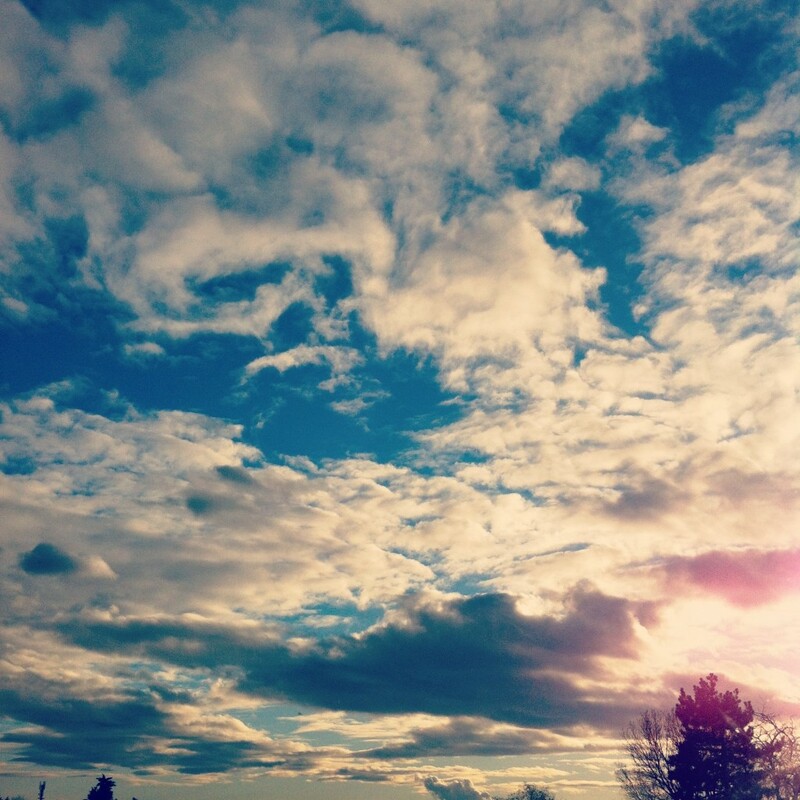 Thank you for taking the time to share your thoughts and your pictures. Figaro is so cute !! Thanks for info. We’ll be there tomorrow. 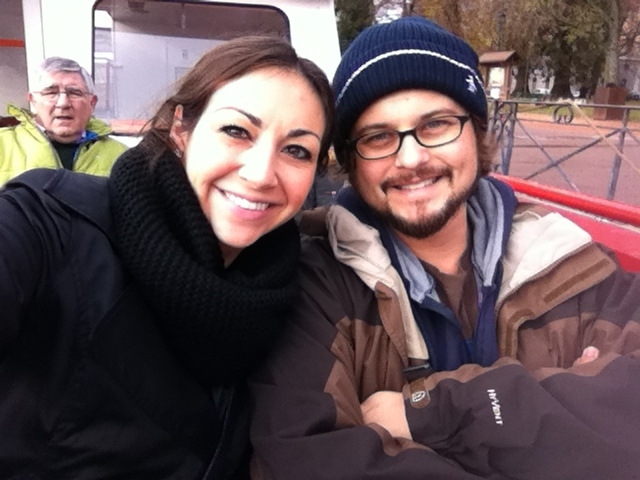 Enjoyed your review of Annecy – we are from Atlanta, Georgia and are heading to France next week. 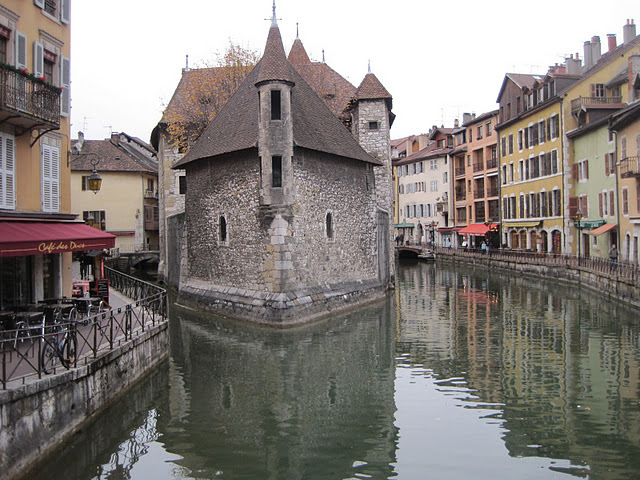 We planned a stay in Annecy and I am delighted to find your suggestions!! hi. 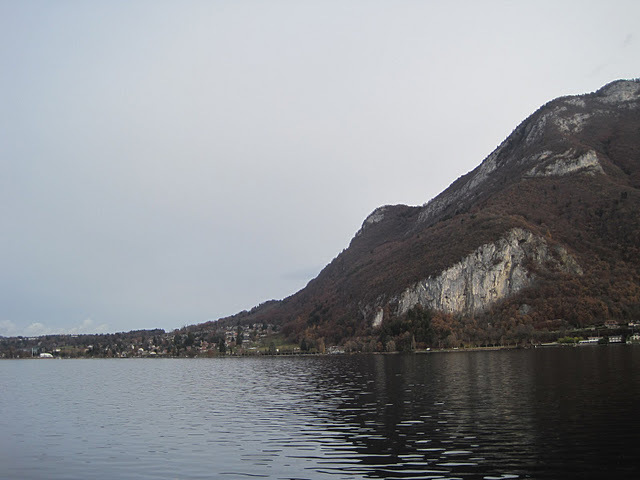 thanks for your report on Annecy. We have just purchased a motorhome and this is going to be our first trip into France with it. We head out on September 1st and we will surely be taking the boat trip and a drink in the local bars. 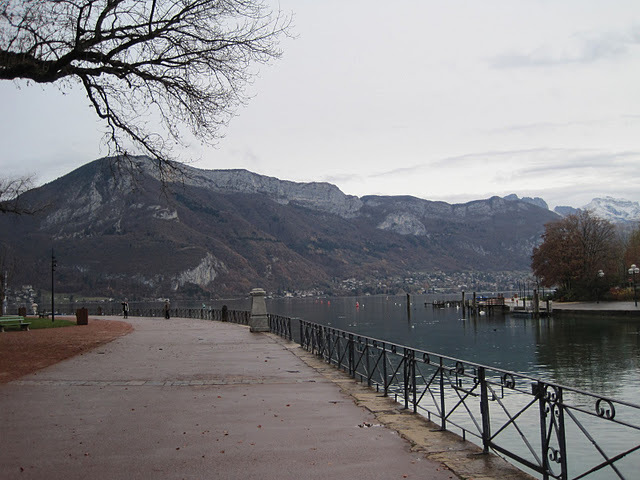 We too saw Annecy for the first time, on a cold, grey wet day – but were totally smitten with this charming town. 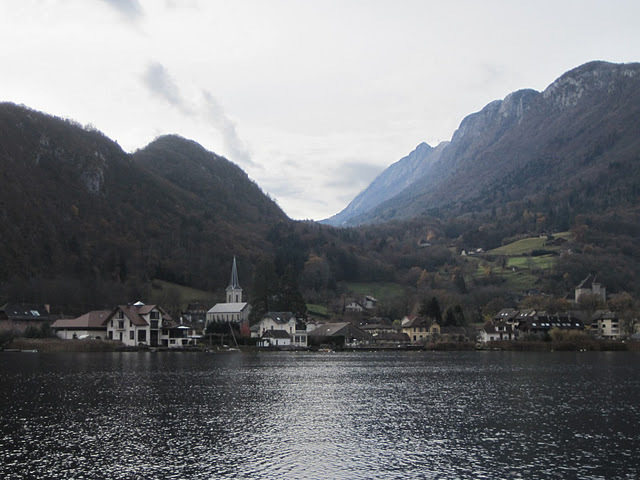 There was something very romantic about the combination of lake, mountains, canals and such a pretty town. 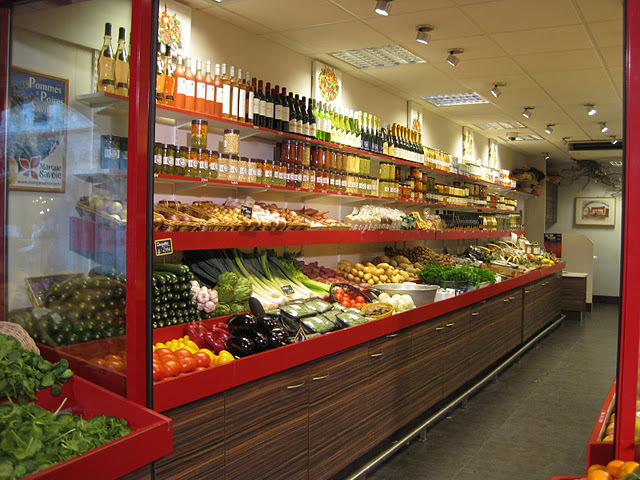 We were on our way to Italy from France, and could see how the Italian earthy colours had spread across the boarder! We will be going back one summer. 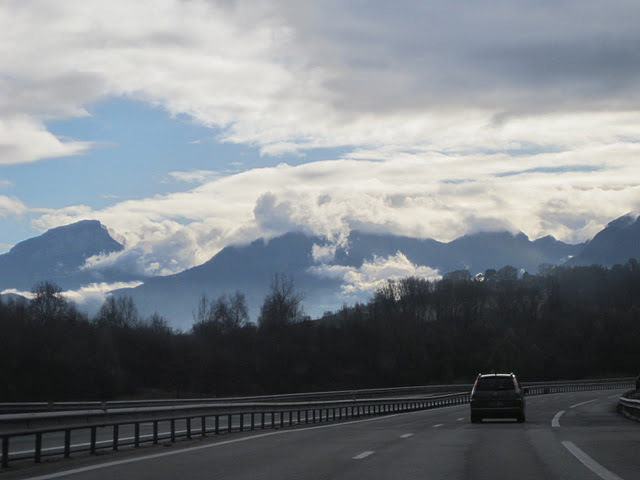 How were the roads heading into Annecy? I am thinking of driving in later this month, just want to make sure I don’t get trapped in any snow! Great article,we have been,at most of the attractions,and I hope,to compleet The Atheres,on the next visit,thanks and Shalom from Jerusalem,the idealism capital.by by until next trip . Thank you so much for showing this beautiful town! 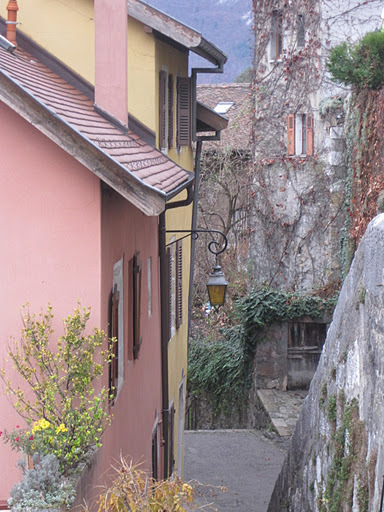 I am planning my first trip (solo) to France and Switzerland from the US for next May. It will be a 2 week, mostly, except Paris, off the beaten path of beautiful towns between Paris and the Alps. I think Annecy will be one of them. Will most likely visit Dijon as well. Would you have any suggestions for other towns to visit? I know basic French and am fairly quiet and reserved. Just want to go to places that are beautiful by train and walk around and soak in the beauty.